UFO Hunters Find Ancient Tree Stump on Mars? Nope, Just a Rock. One of the favorite activities of alleged UFO hunters and paranormal “investigators” is to trawl through images recorded by NASA from various places in the universe. In particular, there is somewhat of an obsession with images from the Moon and Mars. This is probably because they are some of our closest neighbors in space, but also because the Moon landing and the Mars Curiosity Rover mission has such large impact on the public perception of space exploration. Of course, these missions are also surrounded by pseudoscientific conspiracy theories, making them very attractive for UFO hunters and other cranks to hover around. This, combined with the fact that the NASA multimedia library contains over 140 000 image, video and audio entries, creates a perfect storm for abuse. Because there is so much content available, one can easily find things that superficially look weird, out-of-place or even similar to common objects on Earth just by sheer coincidence. Other times, it requires a lot of squinting, zooming, image manipulation and other cognitive trickery to force the supernatural interpretation onto the images. Previously, Debunking Denialism covered a case where UFO hunter Scott C. Waring claimed that he had found a rodent on Mars. Turns out that he had searched through the NASA image library and found an image of a Mars rock that kind of looked like a rodent if you zoomed in an squinted a bit. In reality, it was a clear case of unchecked pareidolia and confirmation bias. In other words, Waring had an overactive pattern detection and only looked at reasons for why the Mars rock might look like a squirrel while ignoring reasons for why it is really just a rock. Ancient Tree Stump on Mars? In a YouTube video called “Possible Tree Stump Found On Mars?” posted by Paranormal Crucible (135k subscribers) on April 20, 2017, the video creator had taken an image from the Mars Curiosity Rover archives taken on Sol 1647 (25 March, 2017) at 07:19:49 UTC. The full resolution can be found here. This has many similarities with previous cases that have been debunked by skeptics. It is a single image taken from a large library which inflates probabilistic resources available, it is grainy, the video involves zooming in, squinting, a lot of shoehorning and even image manipulation to make the facts fit the idea being proposed about ancient tree stumps on Mars. Intriguing object found by the curiosity rover, this time a possible tree stump. 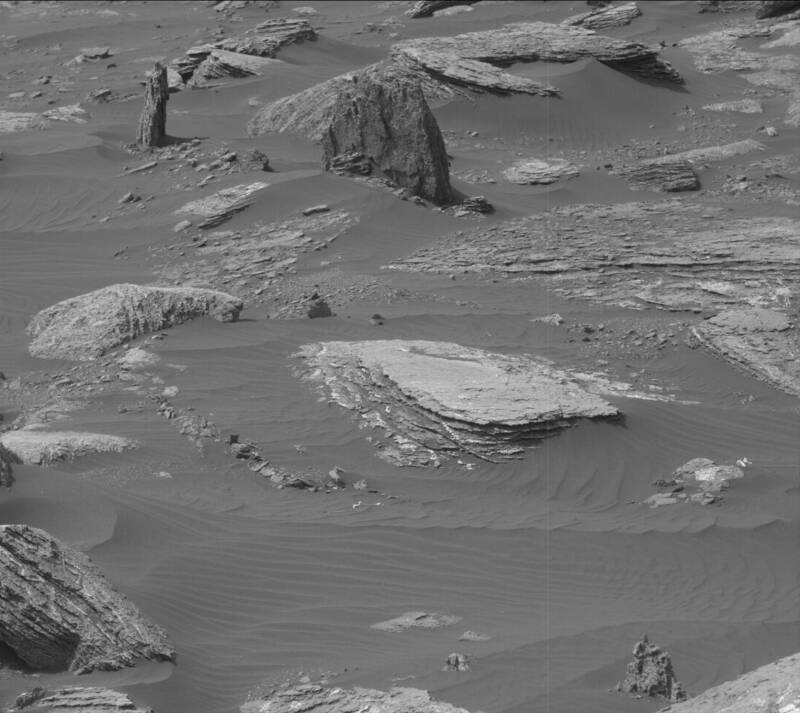 This object definitely looks out of place and in my opinion could be the petrified remnants of a Martian tree. Object is around 3 feet in height, and with numerous discoveries of plant and animal life on mars, it would be logical to assume, that a variety of tree either existed, or still exists on this enigmatic planet. First, notice how the video creator points to alleged previous discoveries of “plant and animal life” on the planet without giving any reference or citation whatsoever. There is also no attempt made to engage with the criticism leveled against these supposed sightings. Second, the arguments rest in large part on an object looking “out-of-place”, which is a key red flag that intuition, rather than scientific reasoning, is being used. What does it even mean for a UFO hunter to claim that something looks out-of-place on Mars? Has he or she visited the planet or extensively researched the environment of Mars? Probably not. So intuition about the unknown is not an accurate guide to for finding out true facts about reality. Third, the video creator merely jumps to the conclusion that it is a petrified tree. No evidence and no real rational reasoning is presented and no engagement with the obvious critical questions that arises when faced with such a claim is done. The video itself repeats many of the same well-known tricks that UFO hunters use to make some detail in Mars images fit with some object on Earth. The video creator shows us a few image from tree stump from Earth. After that, the image manipulation begins. Besides having zoomed in and made the image even grainier, the video creator wants to “process and enhance” it. Contrary to episodes of popular television series involving forensic investigation or cyber crime, you cannot enhance images to get any more information out of them that was not already there when the image was taken. If you are using a low quality camera, no amount of computer-based “enhancement” will allow you to get as much detail as you would have if you had started with a crisp high-definition image. What kind of “processing” and “enhancements” are being done in this video? Turns out that the video creator does not tell us. So we are left wondering what exactly these “processing” and “enhancement” methods were and how they altered the image. Just from visually looking at the manipulated image, it looks more or less like someone with average image editing skills in Photoshop tried to make it look more like a tree stump on Earth by changing some of the surface features, sense of depth and color. This is no longer just unintentional pareidolia and confirmation bias, but intentional and deceptive image manipulation to distort the evidence to fit the UFO hunting narrative. The manipulated image is then shown at different resolutions and compared with the previously shown tree stumps from Earth. So what is the structure that appears on the image from the NASA Curiosity Rover if it is not an ancient tree stump? First, even if we had no idea or evidence regarding the true nature of this structure, one is not justified in automatically concluding that it just must be a tree stump. This is because the burden of evidence is on the person making the claim, and since this is a quite extraordinary claim, it requires extraordinary evidence. Merely basing it on intuition and manipulated images is nowhere near sufficient. There are many scientific reasons to be skeptical of the claim that this is an old tree stump. First, trees are a group of organisms living on Earth. Even if there was life on Mars, we cannot assume that it evolved the same way as on Earth or that trees is a common evolutionary product. For all we know, life on other planets might evolve very differently or even not evolve multicellularity at all. We just do not know. Second, trees require specific concentrations of oxygen and carbon dioxide in the atmosphere to live and the atmosphere on Mars contains 96% carbon dioxide and only trace amounts of oxygen. In order for a tree to grow, it requires many more substances and nutrients, from water to nitrogen-containing ions. These are generally not available on Mars. Third, on Earth, specific bacteria make nitrogen-containing ions from nitrogen gas in the atmosphere, and there are no reason to suppose that bacteria adapted to live in symbiotic relationship with trees exist on Mars. For this and many other reasons, we can conclude that the environment is not suitable for trees or plants generally to live on Mars. So what is the structure on the NASA image from the Curiosity Rover? It is probably just another rock. This is because rocks are common on Mars and this specific structure has similar layers to rocks around it. This is by far a more likely and scientifically plausible explanation than just assuming that it must be a tree stump. Yet, if the UFO hunters had accepted this explanation, there would be nothing left to make a video about and no attention to their paranormal “investigations”. How did the news media handle this story? Badly. Predictably, many news websites carried this story poorly. Most common was the classic journalist false balance where equal time is given to the batshit UFO hunter idea and critical voices with scientific evidence debunking it. Fox News Tech used a clickbait headline suggesting that an ancient tree stump had been found on Mars, gave ample space to the UFO hunter narrative while only allowing critical voices to be heard in a single paragraph that was only focused on two comments on the YouTube video. The rest of the article briefly mentioned previous claims from the same ideological environment, again without a hint of skeptical analysis. Other sources, such as AOL took an even lazier approach, whereas The Sun did not even mention any alternative explanation or any criticism whatsoever of the idea that this rock formation is really a tree stump. The Daily Mail published a much more detailed article, but instead of including a critical analysis, it just gave space to even more UFO hunter claims about trees and lakes on NASA. The only critical content was a mention in the preamble that it could be a rock. No analysis of the arguments and claims made by the UFO hunters or their image manipulation methods. Just attention-seeking clickbait for views. No intellectual content whatsoever. This highlights, yet again, the fact that some news media are contributing to the ongoing misinformation wars. We deserve better. I’m beginning to wonder if these UFO hunters are becoming desperate. I took a look at the previous videos posted to the YouTube channel “Paranormal Crucible” and there are about 300 similar videos, and this is just one account. They might just have had this approach all along. This is the second time that I have read your blog. Thank you so much, “Debunking Denialism”, if it wasnt for you, I would still be brainwashed and fooled by now. Pseudo-science is pernicious, poisonous to the minds of the people who has the urge to know the truth. I really appreciated the way you impart the counter claims and criticism, not to “criticize” the bloggers out there, but to clarify their claims. 🙂 I get by with limiting my exposure. Once I get irritated I know it is time to distract myself with other things. Where I really have problems is when someone leaves the tv in the other room on the H channel and some sort of mind rot leaks out where I can hear it. Justifying all sorts of nonsense with perhaps and maybes sets off some sort of red alert.